From Concept To Completion… and Beyond! 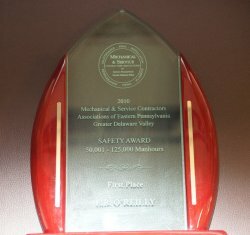 Our Mission is to continue to grow our reputation as the leading HVAC construction and service organization in the Mid-Atlantic area. We will continually strive to exceed the expectations of not only our customers (general contractors, owners, architects, engineers and construction management companies), but of our sub-contractors, vendors and fellow employees. We will accomplish this by committing to our shared values and by achieving the highest levels of customer satisfaction with extraordinary emphasis on the creation of value. We shall also endeavor to provide enhanced employee training and new lines of service including an emphasis on “green” building. We respect all those that make our business a successful one. So many people are involved in the running of our everyday business and it is those relationships that we hold as invaluable and will do everything in our power to build strong, lasting partnerships. E. B. O’Reilly feels that the personal safety and health is of primary importance. To the greatest degree possible, management works diligently to provide all necessary resources required to maintain the highest degree of personal safety and health. We will maintain a safety and health program conforming to our industry’s best practices. Our objective is a safety and health program that will help reduce injuries and illnesses to an absolute minimum, not merely in keeping with, but surpassing, the best experience of other operations similar to ours. E. B. O’Reilly remains firmly committed to providing our employees with a safe and healthy work environment. It is a matter of company policy to provide not only our employees but all working on each jobsite, with all pertinent information regarding hazardous chemicals on the worksite through our hazard communication program. This program includes container labeling, material safety data sheets (SDS) and employee information/training. Our Safety Committee holds monthly meetings which build a cooperative climate by providing employees the opportunity to contribute ideas and to make suggestions that may improve quality, productivity, morale and safety. To request a copy of our Safety Manual, click here.